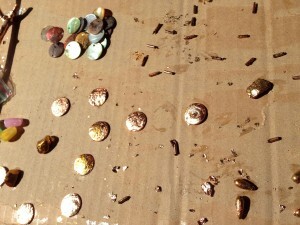 In forests, cemeteries, on beaches, I collect wood, feathers, shells or little stones. Back home I keep them somewhere to remember the moments. There comes a desire to weave these memories into the everyday practice of electronic textiles. 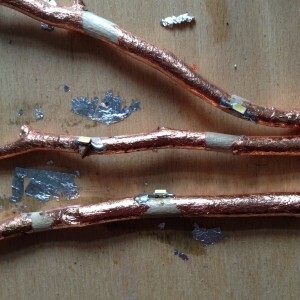 I think about adding a conductive layer to the materials for them to be part of a simple circuit. The parts of this tilt sensor are made of wooden sticks and seeds plated with “gold leaves”. The gold flakes are made of aluminum and coloured in copper. The magic lies in their conductivity, and they also allow for the use of a soldering iron. An SMD LED completes a test circuit, and illuminates; the “switch” being the interaction of the plated objects in one of the tilt position. 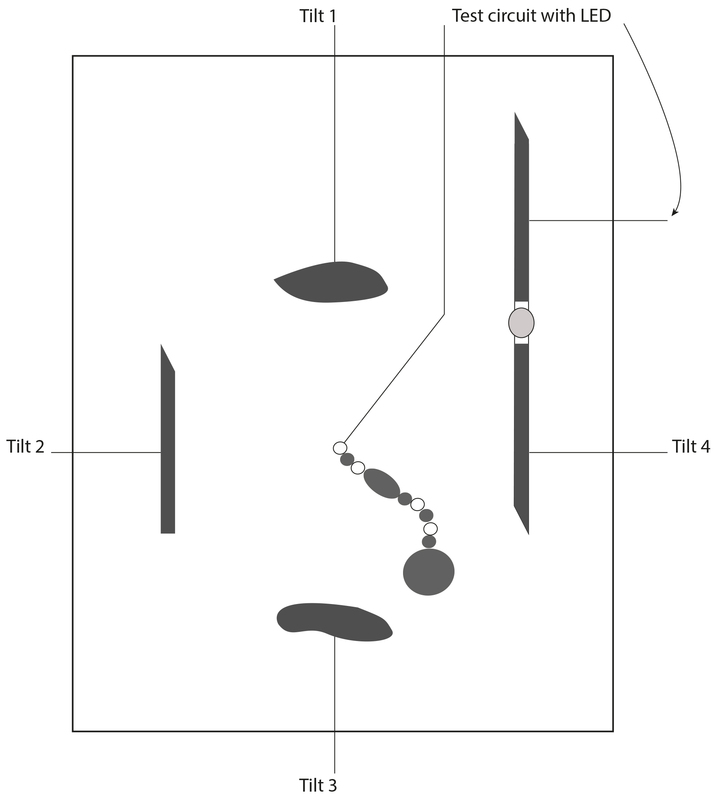 For something to activate the moving element, the beads would make contact, and trigger the `Tilt`. 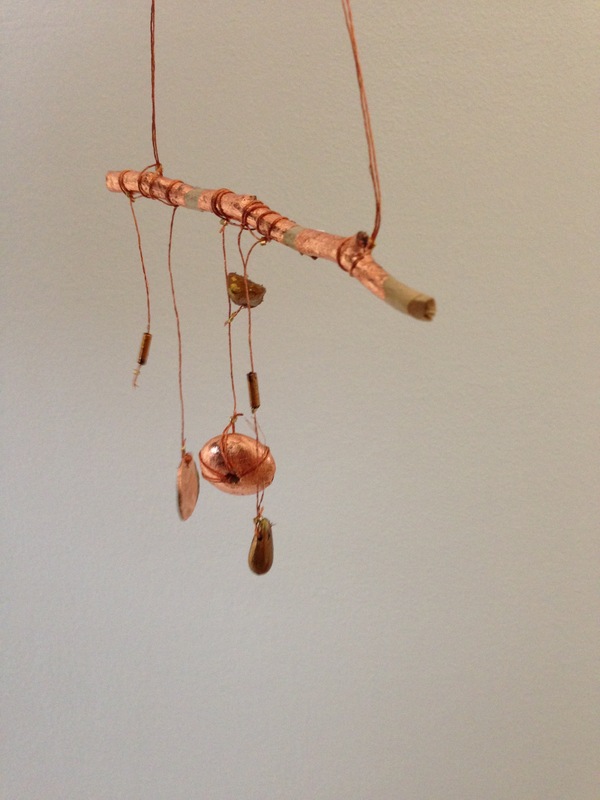 The first version as a mobile was a working prototype to test the conductivity. The second and final version is a woven tilt sensor including a test circuit with an LED. 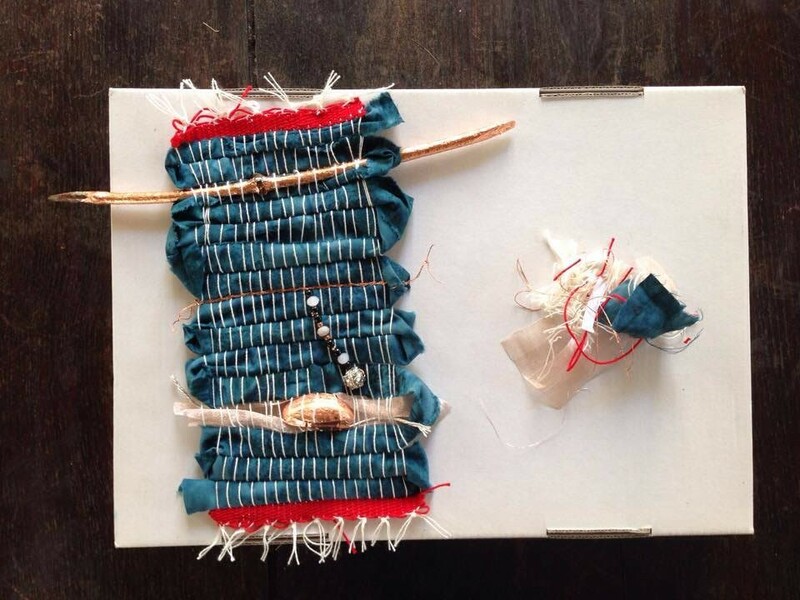 DIY attitude of the Kit-of-no-parts project by Hannah Perner-Wilson http://kit-of-no-parts.at. 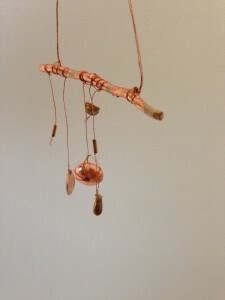 Other long-term inspirations are namely Alexander Calder http://www.calder.org/work/by-category/toy and dreamcatchers. Cotton yarn for the warp and various materials for the warp, including conductive lines for contacts. Gold flakes are glued and vanished with specific glue (the whole set is easily available to buy in hobby shops). The integration of plated materials happens during the weaving process on a laser cut loom. save a short line where you intend to place the smd LED later so it won´t shortcut. 2- After about 20 minutes the glue is ready for the metal leaf to be applied. Carefully roll the stick over the gold leaf and press with your fngers to keep the shape of the stick.Do so on both sides and keep the LED place free from metal. a second layer significantly improves the conductivity by covering tiny breaks of the first layer. 4- Solder the LED very carefully, the leaf burns quickly! I melt tin on the tip of the iron and apply it first to both pads of the smd. Then I melt fresh tin again on the tip and “brush” over the metallc stick on two spots. Then, holding the LED with twizzers, quickly heat up and place the LED at its intended spot. NOTE: Watch out LED polarity if you plan a certain circuit. 5- At this point it is important to test if the LED brights up. If yes, great step 6 will be on a smaller area.If not, check with a multimeter if LED pads and ends of the stick conduct. Try along the stick if you get it working or not. Step 1 to 3 are the same for the nut. Repeat it once. 2- Integrate the nut with a conductive material for contact.